Check out PRSA Austin Chapter's upcoming event! Join PRSA Austin to learn firsthand from our speaker, Emily Wright, about the opportunities and challenges of social good initiatives and the lessons learned working on campaigns for Whole Foods and Bumble. She will share why businesses should lead with their mission and her experience when Whole Foods offered a million dollars to flood victims to Bumble launching a fund to support women entrepreneurs. Emily Wright currently serves as Bumble's Associate Director of Global PR. Emily began her career at Bumble in September 2017 as Bumble's first in-house PR hire. Emily has since built the company's PR team and helps lead press initiatives across the company's key markets in North America, Asia Pacific and Europe. Prior to Bumble, Emily spent over five years at Whole Foods Market working in Global PR and Corporate Communications. Emily received her Bachelor of Science in Public Relations from the Moody College of Communications at The University of Texas and graduated from the college as a Senior Fellow. Emily is also on the board of directors for the local nonprofit Austin Partners in Education. Thank you for your interest in our Master’s Breakfast on Thursday, April 18 with Emily Wright of Bumble. Unfortunately, registration is now closed. Time: 8:15 - 9:30 a.m.
PRSA Austin Chapter's new Masters Class series is designed with the seasoned professional in mind, open to PRSA Austin Chapter members with 10 or more years of experience in the industry. Join us for in-depth discussions and insights into the issues that matter most while networking with your peers. 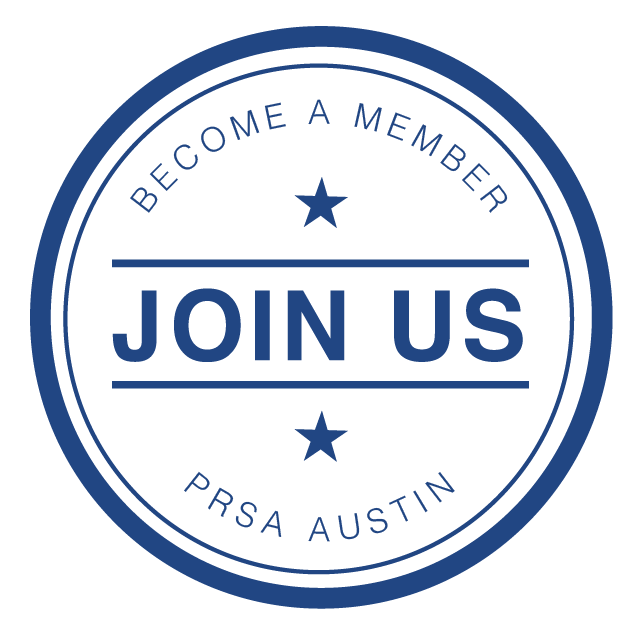 Visit prsa.austin.org for upcoming events and more information.